As this is quite a long article we have divided it into two sections. Click on Part 1 for the first section. Lenton Fair is almost as old an institution as the priory was, for while the priory was certainly founded before the year 1108 the fair was granted and confirmed by a charter of Henry II about the year 1164. It was to last eight days, commencing on the feast of St. Martin every year. The monks were empowered to levy toll on The title page from the book.everything that it is usual to tax, excepting those purchases which were made for food or clothing. It was enjoined that neither the Sheriff nor the Castellan of Nottingham should molest the monks in the slaughter of oxen, nor in anything else to which they had been accustomed; but should buy in such market as others coming to the fair from long distances. It was also commanded that the monks and their goods, chattels and tenants, should be free from all secular service and charges. This grant was confirmed by John in the year 1200. The duration of the fair was afterwards extended by a charter of Henry III to twelve days. Lenton being so close to Nottingham its fair led to a dispute about the year 1300 between the Prior of Lenton and the Mayor of Nottingham as to their respective rights and privileges. The matter was ultimately settled by an agreement by which the Prior and monks of Lenton undertook to give up four days of their fair, thus reducing it to eight, as it was before the charter of Henry III, and they also solemnly promised that neither they nor their successors should afterwards make any petition to the king or any man to obtain any further extension of the duration of the fair, 'to the damage and detriment of the Mayor and Burgesses of Nottingham, or of their heirs.' Moreover the Prior and convent of Lenton stipulated with the Mayor and Burgesses that cloth merchants, apothecaries, pilchers and mercers belonging to the town who wished to hire booths at Lenton fair should pay 12d. for each booth for as long as the fair lasted, or 8d. if they covered the booth with their own covering, or engaged it uncovered. All other traders were to be charged 8d. for a booth, excepting those selling iron. Those who wished to hire a booth or occupy land were to be charged 4d. for the booth, and if they did not occupy land, each of them was to give 2d. Tanners and shoemakers who did not occupy land were to be free from the regulations relating to covered and uncovered stalls, and from all action pertaining to stallage. Each booth was to be eight feet in length and the same in breadth. Local merchants were forbidden, under penalty of being removed from the fair, from hiring booths for the use of strangers, or selling goods from a distance except for their own profit, or on behalf of a Nottingham merchant. And it was arranged that if any were poor, and had in past times been used to give nothing for their stalls, they were henceforth to have their stallage free. All men from Nottingham buying or selling hides were to be free from toll, and likewise all passing through Lenton at fair time with carts, wagons, and pack-horses. For these privileges the Mayor and Burgesses of Nottingham granted to the Prior and convent of Lenton a building in the Saturday market for ever which Gilbert de Beeston had lately held, and which his ancestors in times past had assigned to the predecessors of the then Prior and convent. No market was to be held within the town of Nottingham whileThe contents page from the book. the fair at Lenton lasted, except within houses and in doors and windows, not even for the sale of bread and fish and meat, and other victuals. And the Prior and convent were to receive toll in Nottingham so long as the fair lasted, just as they were entitled to do at Lenton, and in return for this and for a dinner which it had hitherto been the custom of the Prior and convent to give the Mayor and Burgesses, they were to pay the sum of 20s. At the same time Lenton fair was to be duly proclaimed at Nottingham as at Lenton. Some curious extracts from the Nottingham Borough records of the time of Richard II thrown [sic] light on the character of the fair at that period. In one of these cases Roger Wilding, of Radford, complains that his shepherd left the sheep he was placed in charge of at Nottingham to attend Lenton fair, the result being that the sheep found their way into the pinfold, and were there two days at a cost to the owner of 40s. In another case Roger de Strelley complains that some ale which Agnes, the wife of William Brodbury, of Nottingham, had agreed to brew for him for Lenton fair, at the price of 2d. a flagon, was not so good as ale which he had had before from them, and therefore not according to agreement. It turned out that Agnes had kept her best ale at Nottingham and sold it at 3d. and had sent the inferior ale to Lenton, 'to the damage of the said Roger of 20s.' From another case in connection with Lenton fair in the same year (1397) we learn that the price of an ordinary long bow was then 2s. It appears from ancient documents that among other things dealt in at Lenton fair at this time were church ornaments, such as chalices, books, and vestments; besides linen cloth, woollen cloth, brass, pewter, bedding, iron, flax, wax, bows, and leather gloves. It seems that 'in the year 1500 it was part of the duty of the Mayor of Nottingham to give the common council knowledge for to see the sports at the fishings, bear baitings, and bull baitings within the town, after the old customs and usages, and to make search the week before Lenton fair for white herrings and salt fish.' In the early part of the reign of Henry VIII the strife between the Prior of Lenton and the Mayor of Nottingham as to the fair again broke out on pretty much the same grounds as before, and after going on for some years was terminated by the king enjoining the mediation of Sir Thomas Lovell, steward of the priory and governor of Nottingham Castle. The agreement come to was practically the same as in the former dispute, except that no market bell was to be rung at Nottingham during Lenton fair. At the dissolution of the priory the yearly profit derived from Lenton fair amounted to £12. In 1603 the plague was rife in various parts of the country, and lest infection should be carried into the town by some of the great number of strangers who visited Lenton fair, the inhabitants of Nottingham were 'forbade going to Lenton Fair, unless to buy horses or beasts, on pain of imprisonment and disenfranchisement; and none to go there to buy London wares or to deal in such wares for two months.' And men were stationed at certain points of the roads between Nottingham and Lenton to see that this regulation was obeyed. Moreover, four 'honest men' were deputed to go to Lenton and see if any of the inhabitants had offended against this order. 'Ald. William Gregory, who purchased the manor of Lenton, with its fair and other privileges filed a bill in equity in the year 1646, to compel the Corporation of Nottingham to enforce on the town the charter of Henry II, which commanded that during Lenton Fair 'no man should buy or sell in Nottingham' and which injunction it appears had long been disregarded.' The burgesses thus threatened, however, petitioned the Corporation to defend them, and the Council resolving to accede to their request, no more was heard of the matter. George Gregory Esq., grandson of this alderman, obtained from Charles II, in 1663, a grant of another fair to be held at Lenton every year on the Wednesday in Whit week, and to last six days. At that time Lenton fair seems to have been greatly renowned as a fair for all sorts of horses, pretty much as it is now. Although for several years past the fairs at Lenton have been declining in importance, and have dwindled down to one day each, they are still largely frequented by farmers and horse dealers. All other business has long since ceased. We now come to the parish registers and the vicarage, which are treated on in Sections VII and V respectively. The parish registers of Lenton date back to the year 1540, and with the exception of those at Ordsall and Askham are the oldest in Nottinghamshire. For some unknown reason only the marriages and burials are recorded from that early date, however, and it was not till 1592 that the first baptism was registered. A long list of the more noteworthy entries is quoted from the parchment volumes in which the records are preserved, accompanied by a large number of annotations relating to their family history and relationship, contributed by Major A.E. Lowe F.S.A. The earliest mention of a Vicar of Lenton is that of Rober Anger, who was instituted in 1274. Towards the close of the thirteenth century the rectory passed into the hands of the Prior of Lenton, and the vicar received an annual pension from him. In 1534, however, the relative position of the vicar and the prior had changed and 'the then vicar of Lenton is recorded to have had a house with one acre of glebe land, and was entitled to the tithes of lambs and fleeces, pigs, fowls and eggs, flax and hemp, and certain other things including daily meals in the kitchen of the Priory, and fodder for one horse, provided by the Prior, which, together with oblations and all other ecclesiastical dues, amounted in all to £10 11s. 1d. per annum; but out of this the vicar had to pay an annual pension of £1 8s. 8d. to the Prior of Lenton, so that his clear yearly stipend at that period was £9 2s. 4d.' The living is now worth £380 a year with house. There is no distinct record of the existence of a parish church before the time of the Reformation, and it is supposed that the parishioners attended service within the Priory precincts, as has been already pointed out. From a curious return made by John Francis, curate of Lenton in 1676 'it appears that there were then 160 communicants and not a single Papist or Nonconformist in the parish.' But although the parish was so completely in the hands of the Church at this period, there seems to have been no presentation to the vicarage for a considerable interval the duties being performed by the vicars of the adjoining parish of Radford, who were permitted to hold the office in commendam. 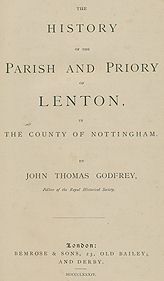 A curious historical feature about Lenton is that it formed an important part of the princely Honour of Peverel, an account of which Mr Godfrey gives in the sixteenth section. The Honour of Peverel is one of those relics of feudalism that has left scarcely a trace behind. And the very name by which the ancient jurisdiction was Copies of seals used by the Peverel Court. known sounds odd nowadays. An 'Honour', it appears, was the title of a more noble sort of lordship than that of manor, and other and inferior estates were made dependent by being required to perform certain service to this manorial chief. To constitute an 'Honour' it was essential that it should be holden of the king. Hence the Honour of Peverel is supposed to have been created by William the Conqueror, and granted by him to William Peverel, and in the course of time we find it again and again reverting to the Crown. When in the height of its power the Honour of Peverel comprised no less than 127 towns and villages in Nottinghamshire and 120 in Derbyshire, and its jurisdiction was extended by Charles II (1674) so as to include the towns of Worksop, Chesterfield, Sheffield and Rotherham. 'To this Honour there was attached a court of some description, but there is no way of ascertaining correctly what was its nature or jurisdiction.' It seems, however, to have comprised a Court of Record, which had jurisdiction to hear and dispose of all felonies (death of man excepted) and common nuisances. This was what in feudal times was called the Tourn (Sheriff's tourn, or round through the shire). This court was held twice a year at Nottingham originally in the Anglo Saxon chapel dedicated to St. James, the site of which was till recently occupied by the Independent chapel in St. James'-street, Nottingham. Besides the jurisdiction over felonies and nuisances usually exercised by the Sheriffs, the Court of the Honour of Peverel exercised the View of Frankpledge. We are not told what this 'View of Frankpledge' was, but from other sources we learn that it was an institution which performed about the same sort of duties as are now done by the police. Every man was pledged to keep the peace, and for this purpose ten men were bound for each other so that if any of their number offended the others were pledged to bring him to justice. 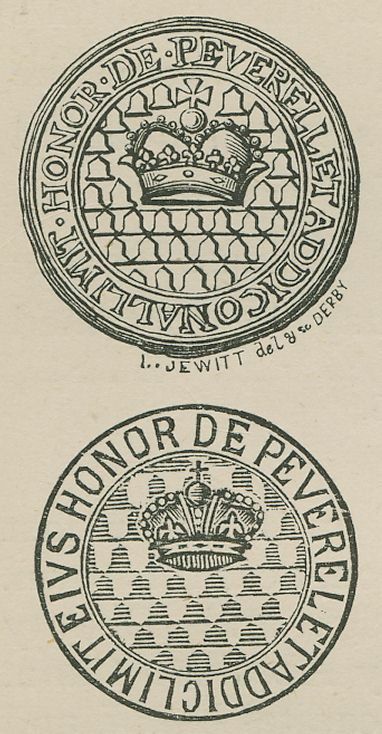 In 1155 when the possessions of the Honour were held by the grandson of the first Peverel, they were confiscated by the King (Henry II), apparently on account of the devotion with which Peverel had supported the cause of the late King (Stephen). After the Honour came into the King's hands, the Constable or Warder of Nottingham Castle was appointed to preside over the Tourn or Court of Record; while over the Frankpledge an officer in the nature of a Bailiff presided, and from the time that the Honour came into the hands of the Crown until the 10th year of the reign of Edward III the office was granted or leased out at an annual rent. In 1321 when Edward II held his Court in Nottingham Castle, he granted the Corporation of the town exemption from the jurisdiction of the Court of the Honour of Peverel. The Honour was at that time in the hands of the King. In 1336 Edward III granted to his 'well beloved' William Eland, and his heirs, for ever, for the yearly payment of fourteen marc (£9 6s. 8d.) 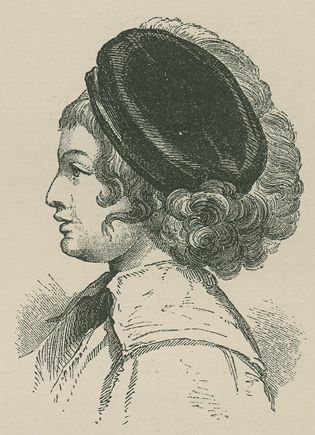 the Balliwick of the Honour of Peverel, in consideration of the great services he had rendered in the capture of Roger Mortimer, Earl of March, at the Castle of Nottingham. 'On the grant being made to William Eland, the elder (1336) it would appear that the Court was removed from the County Hall, where it had been held since the year 1316, to the mansion occupied by William Eland, Constable of Nottingham Castle, at the Manor of Algarthorpe in the parish of Basford.' Henry VIII granted the 'inheritance, property and Castle of Nottingham, alias Peverel' to Lord Cromwell, but the estates seem to have been forfeited on the attainder of Lord Cromwell in 1540, and the Honour again reverted to the Crown. The Bailiwick, however, still remained in the Eland family until 1546, when Hugh Revell, cousin and heir of the last of the Elands, obtained a licence from King Henry to transfer the office to Henry Willoughby, of Wollaton, Esquire, in fee, at the old rent due to the Crown. By an indenture this Hugh Revell, in consideration of the sum of £80 sold the 'office or Bailiwick of the Honour of Peverel, with all profits, charges, and all records, evidence, court rolls, and writings concerning and belonging to the said office, to the said Henry Willoughby.' This Willoughby was an ancestor of the present Lord Middleton. In 1617 the Bailiwick passed into the Goring family. The Willoughby family recovered the Bailiwick, however, in the reign of Queen Anne (1706), and the office of Lord High Steward of the Honour of Peverel remained in this family till its abolition in 1849. Attached to the Court was a prison, used latterly chiefly for debtors, which at one time was at Radford, but in 1790 was removed along with the Court to Lenton. In that year the court was held for the first time at the Coffee house at Lenton, but was afterwards removed to the White Hart Inn, special apartments at the rear being set apart as a prison. The building used as a prison is still in existence at the back of the White Hart, Lenton. It is a small brick building, 48 feet long and 15 feet wide, two stories in height, and contains three rooms on each floor. The windows are protected by massive iron bars, and overlook a small courtyard. Some idea of the amount of business done at the Peverel Court in its later years is gathered from the fact that as many as 1,344 summonses were issued by the Court during the year ending July 1 1848, though this number was an increase of 840 over the average of the previous three years. More than half the summonses were issued in Sheffield. During the same year the fees received amounted to £228. The court records were removed in 1854 to the Public Record Office, where they are now deposited. The pedigree and arms of the Beauclerk family are given, as well as those of the Gregory family of Nottingham, Lowe of Highfield, Wright of Lenton, and Garland of Lenton, besides arms and seals and other particulars more intimately connected with the parish. There is, of course, a good deal of parochial information about modern Lenton that we have not had space to even mention. Among other miscellaneous information, however, we must refer to the summary of forty-four years of meteorological observations taken at Highfield-house, and specially compiled for the work by Mr E.J. Lowe, F.R.S. Here in a compact table are recorded the variations of temperature for each month, the amount of rainfall, besides the yearly minimums and extremes. From this we learn that the greatest fall of rain was in Interglacial Alluvium of the Trent, resting on a terrace of Lower Mottled Sandstone, Spring Close, Lenton (1879).1872, when 40.4 inches were registered; and the least in 1854 and 1864, when only 17.4 inches fell. The greatest cold was in 1860, when the thermometer indicated eight degrees below zero four feet above the ground. 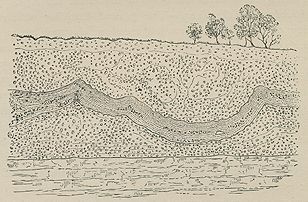 Section the seventeenth is devoted to a description of the geology of the parish, and was contributed by Mr J. Shipman, of Nottingham. 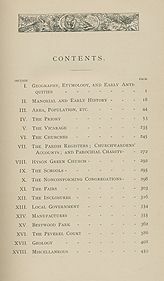 With regard to this part of the work we need only say that the character and relation of the rocks of the parish, with their mineral resources, are dealt with its detail with a lucidity and succinctness calculated to give all the information required without becoming wearisome to the reader. A carefully-drawn plate of geological sections is given, which will no doubt prove of great interest as well as usefulness, but for some unaccountable reason there is no geological map, or indeed map of the parish at all. This is a decided omission. In other aspects it must be admitted that Mr Godfrey has fulfilled his task well. It is no light matter to have hunted up from national and, in many cases, obscure private sources and rare books so much information about such a small area as a single parish. The history of Lenton, in fact, has had to be compiled for the most part from ancient charters and accidental references to the parish in various forms. Of course there is much that we do not know, many documents having apparently been lost, as in the case with some of the leaves of the parish registers. But it is only by gathering together and printing the fragments of history that remain that we can hope to preserve them, and in this respect Mr Godfrey has done a good work. We have criticised the book all we could while giving a brief sketch of its contents, and we must confess that the author has left but little room for revision or correction. A little more information as to certain topographical matters, such as the sites, or probable sites, of ancient buildings which no longer exist, but which are frequently referred to, would have been welcome; and a word or two of explanation of the meaning of some of the terms used in the ancient charters would scarcely have been out of place. Nevertheless the book will form a valuable contribution to a future history of either the borough of Nottingham or of the county. The work is exceedingly well got up, the printing superb, the paper good, and the book is a credit to all concerned in its production. The pity is it was not more widely subscribed for in the first instance so as to justify the printing of a more extended issue.